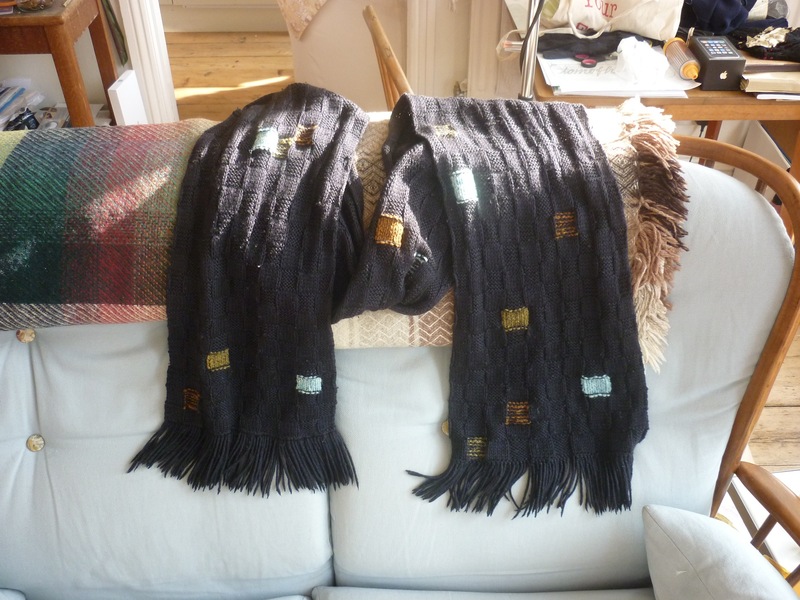 Years ago, when I just caught the knitting bug, I made myself a black brick stitch scarf. It’s a lovely scarf and very soft and comfortable, and I wear it a lot. In fact, I wear it so often, that I’ve started to get a bit bored with it. I no longer appreciate the looks of this scarf and the work I put in it. But what to do about it? I don’t really fancy knitting a new scarf, I don’t want to not wear it (if you know what I mean), and I most definitely don’t want to throw it out either. And yet, I’m bored with this scarf. It’s a classic case of Familiarity Fatigue. I feel there’s only one remedy for this illness: a Fashion Intervention. Regular readers of my blog know that I love my Shetland wool, and indeed you may have identified the two balls in the picture as Jamieson’s Shetland Spindrift. 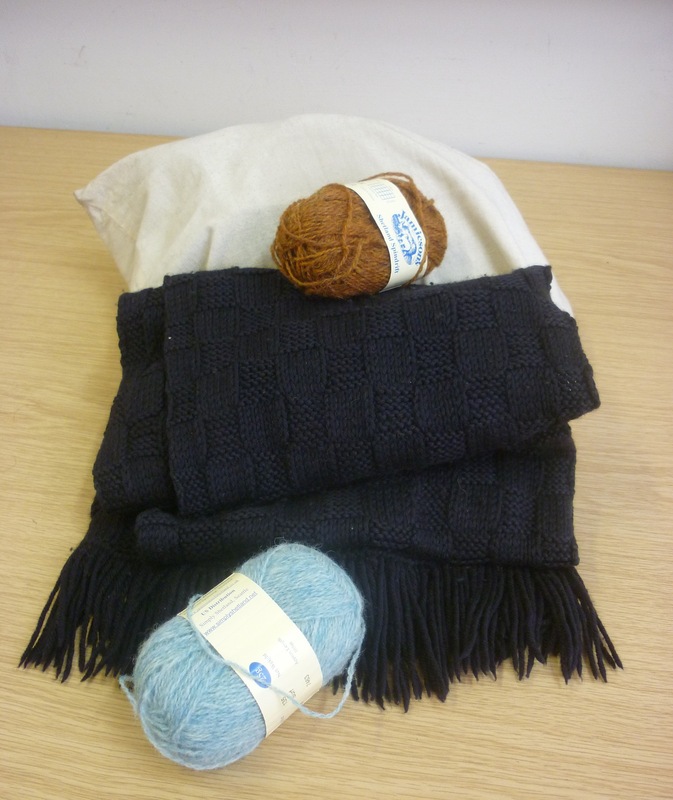 Here’s an excellent opportunity to combine my favourite wool with my once-favourite scarf. 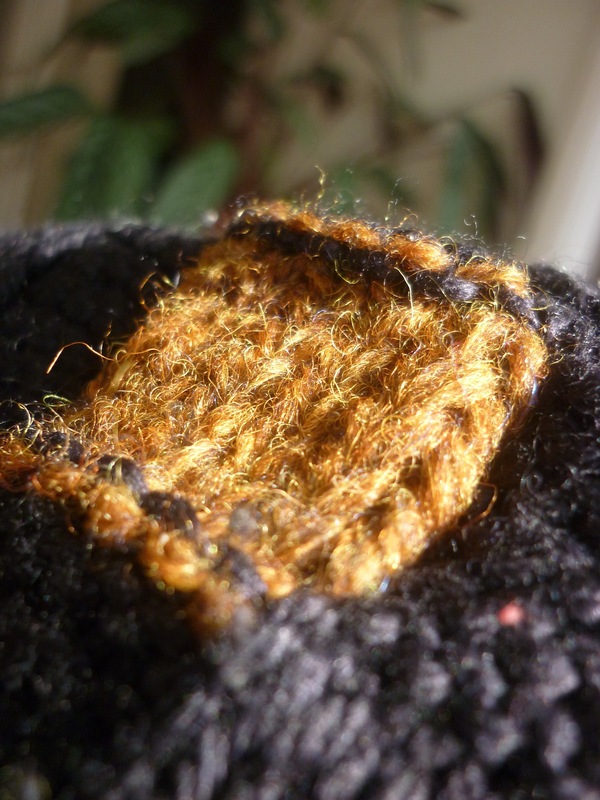 I like the purl side of Swiss darning too. 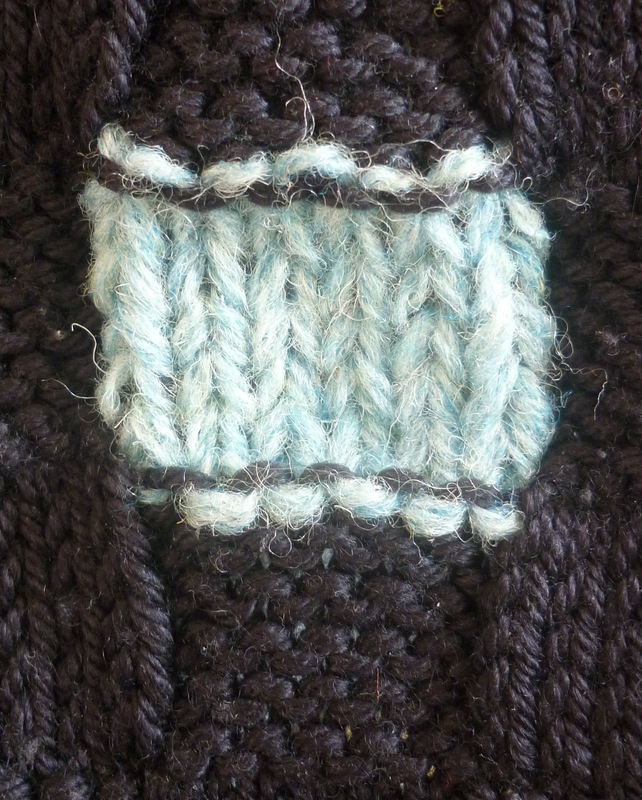 The purl nubs of the original black yarn and those of the coloured yarn create a striped effect. I used three different colours here. Jamieson’s called them ‘surf’, ‘bracken’ and ‘burnt umber’. I think ‘surf’ and ‘bracken’ are particularly well-chosen names for these heathered tones of blue and green. 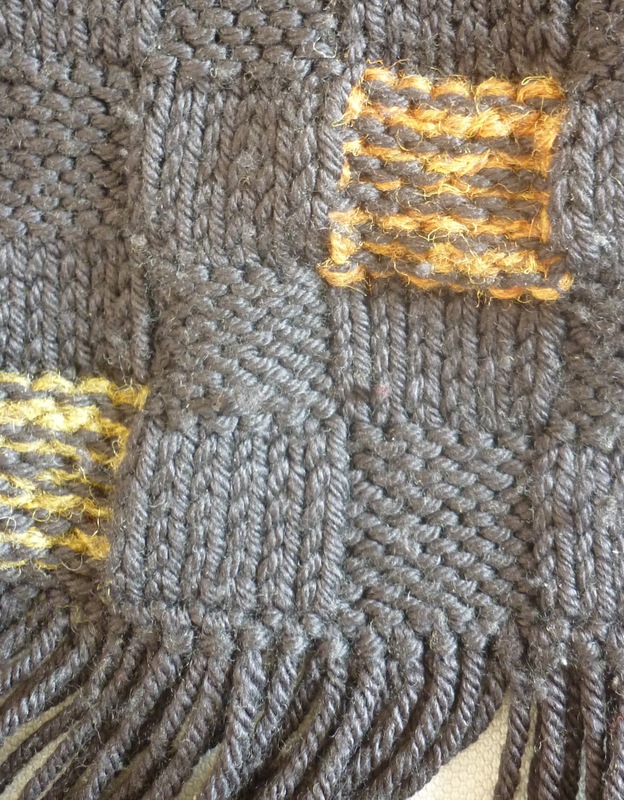 I think the Shetland wool works really well here for various reasons: it provides a nice textural contrast with the supersoft merino/silk blend of the scarf. Then, of course, there’s the contrast between colours and black. 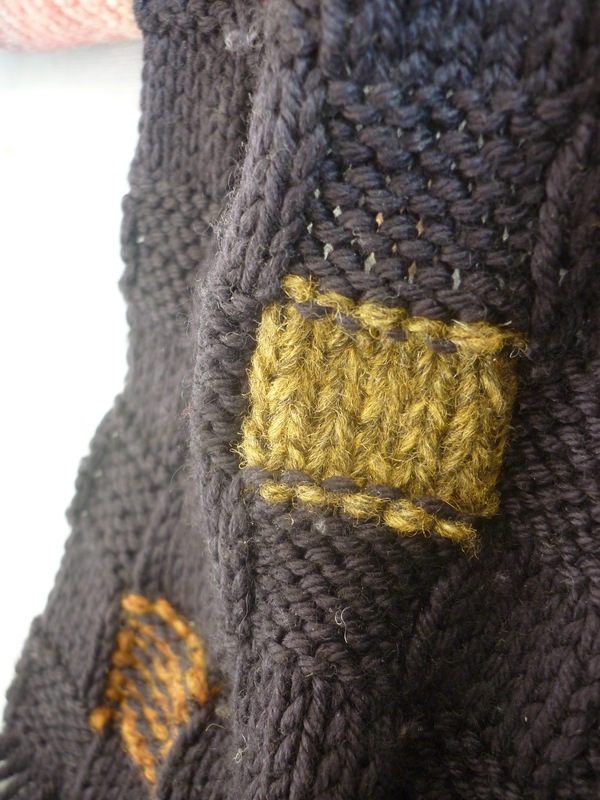 In addition, as Shetland wool is quite ‘grabby’, so it was possible to weave in short ends, and not have to worry they will work themselves out again, especially after a burst of steam to set the yarn. Great idea – looks very good. Love the colours. I love the updates on your scarf! I need to plan a fashion intervention of my own on some things of mine. Your photos are really great as well. What a great “fix”! it looks lovely! Clever, clever idea – I like it. So amazing! I love your practical, funny, warm and always elegant solutions to life’s fashion problems. 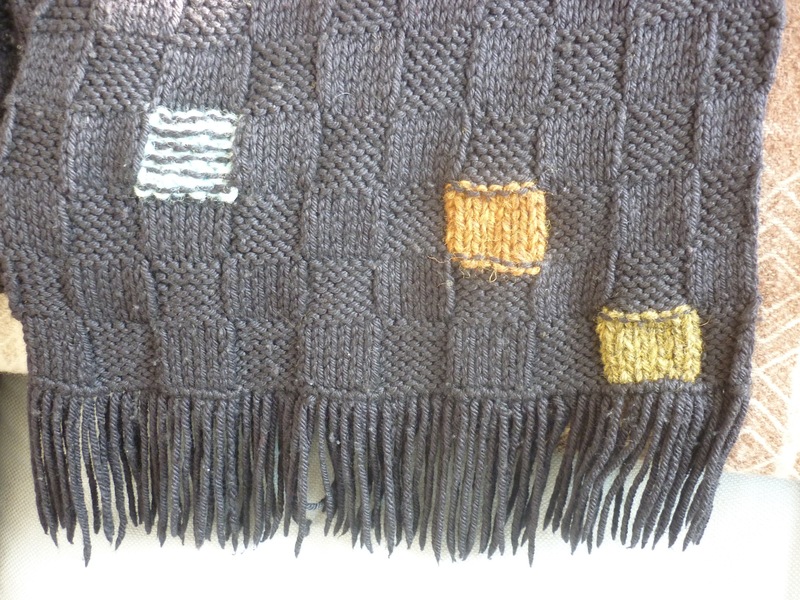 The shetland adds wonderful interest to this scarf and I love the idea of duplicate stitch as “an intervention”. I once stitched over an indelible paint-stain to revive a garment; in light of this post, I shall retrospectively label that activity as “an intervention”. 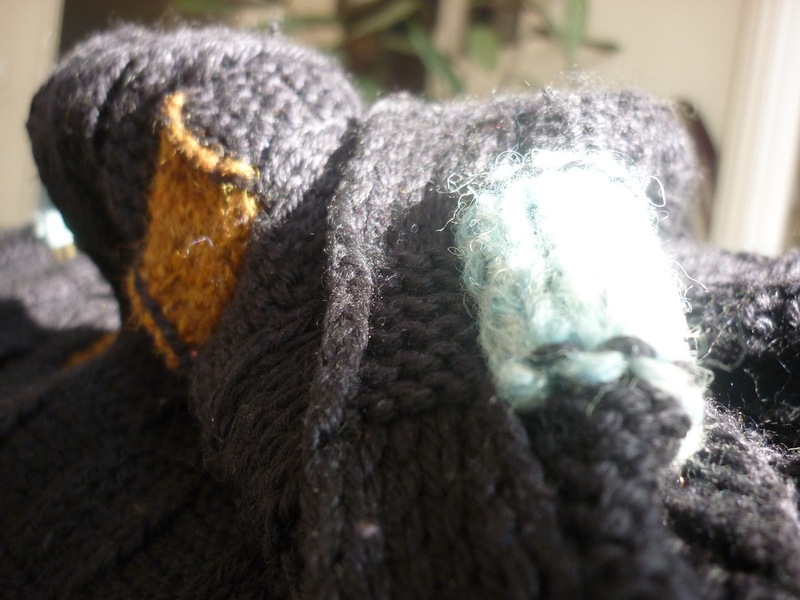 Lizzie and I were checking (y)our darning instructions just this week. There is much to be done, and this is the inspiration we need.